Peer pressure can be a powerful thing, and a German startup is looking to harness it with an ingenious new app called GetUpp that aims to help you honour your commitments. Let’s say that you want an extra nudge to make sure that you go to the gym after work. You use the Web app or iPhone app to specify a trip to the gym, mark the its location on a map and state the time you plan to be there. You can announce your plan on Facebook and can even let your friends vote for whether they think you’ll achieve your goal. From then, the pressure’s on. GetUpp is watching to make sure you stick to your plan. 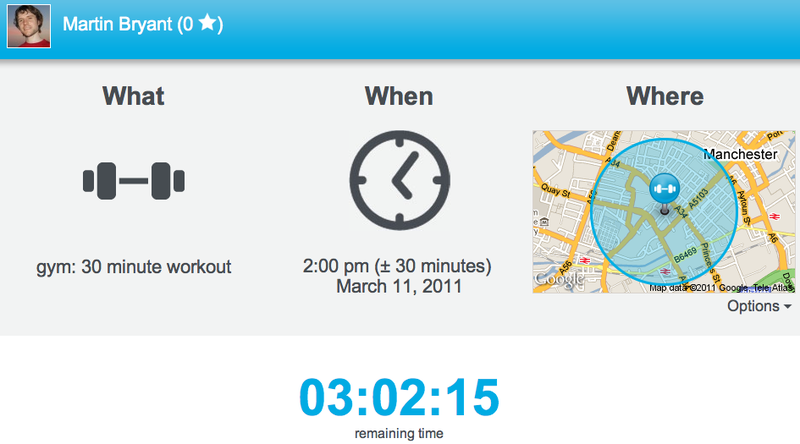 As the deadline approaches, you keep the iPhone app running so it can track your progress using your location. Then, when the time comes, GetUpp will tell your friends whether you met your commitment, or failed miserably, by placing a badge on your wall. While you can opt to not share all your commitments to Facebook, your friends will always be told if you fail. Oh, and you can’t delete the message on your Wall. Motivation if ever it were needed. It’s a beautifully simply idea, and one that could be put to a wide range of uses. I can imagine parents using it to help make sure their children are running to schedule, for example. GetUpp is the product of a Hamburg-based team currently funded by €40,000 raised from savings, family and friends. In the future they plan to help motivate users further with a twist on the badgification – ‘User-generated badges’. “The idea is that users can set up individual badges for certain commitments (for example, running 5 times per week, or studying 50 hours in the library) and then challenge friends or larger audiences (eg folks in Paris) to complete these commitments,” explains Managing Director Dr. Johannes Bruder. Other plans include introducing group commitments that require a number of people to meet up, and serial commitments (for example, staying late in the office five days in a row). Twitter integration and an Android app are both also high priorities for the team. GetUpp is free in the App Store now, and you can manage your commitments via the Web here.